We offer indoor/outdoor tournaments all year around. Our tournament formats include Reverse Coed 4’s (R4), Reverse Coed 2’s (R2), Womens 2’s (W2), Womens 6’s (W6), Mens 6’s (M6) and Co-Ed 6’s (CE6). Compare & you will see we have the lowest prices in Metro Vancouver. Check-in & warm-up 10 minutes before your start time. Be remindful of city traffic flow & limited parking at the gym/grass/beach facility. At a park in east Vancouver. (604) 255-2832 'after' 7:30am for rainout update. Format: 'Mixed' R2, W2 & Reverse M2 in round robin pool play. $50/team. 'Full' team check-in at 8:30am. Round robin play starts shortly thereafter. When registering include the following information: (1) Level of Play -B/A/AA (2) your cell # (3) your partner' name. Double knockout tiered play-offs in early afternoon. Be prepared to play until 5:30pm. 3rd Annual-R4 Cancer Fundraiser for the North Shore Hospice Society. All proceeds to be donated in my late mother's name. $100 per team before April 30, 2019. $120 per team after May 1, 2019. NO REFUND - but you can 'substitute' your own team. Indicate - Recreational/Intermediate/Advance upon registration. Check-in at the drawtable by 8:30am. Round robin warm-up starts at 8:45am. PLEASE let us know what level you are registering for - Rec/Int/Adv. Check-in at the drawtable by 8:30am. Round robin play starts at 8:45am. PLEASE let us know what level you are registering for - B/A/AA. 'Only' R2 tournament at Confederation Park, north Burnaby this summer. We are at the SE corner of the park - 2 blocks N of Beta Avenue off East Hastings Street. $50/team. Level - Adv / Int / Rec. Prorated discount if you pre-pay before May 1st, 2019 ($50) or June 1st, 2019 ($60) or July 1st, 2019 ($70). Event goes drizzle or shine. Minimum 5 round robin matches in the am followed by tiered double knockout play-offs in the early pm. NO REFUND, YOU CAN SUBSTITUTE AN ALTERNATE TEAM, BUT YOU MUST FIND THEM. Please, bring your own food & drinks. No bbq nor beer garden on-site. Gatorade will be supplied. Your portable tents must be weighed down with milk jugs or sandbags. 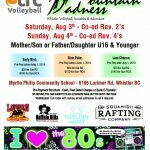 Tournament party / dance Sat, August 3rd, 2019 in the Whistler Village starts at 9pm. Longhorn Pub for dinner (7:30pm) then Buffalo Bills for the dance party (9pm). $100/team. Level - Adv / Int / Rec. Prorated discount if you pre-pay before May 1st, 2019 ($100) or June 1st, 2019 ($120) or July 1st, 2019 ($140). 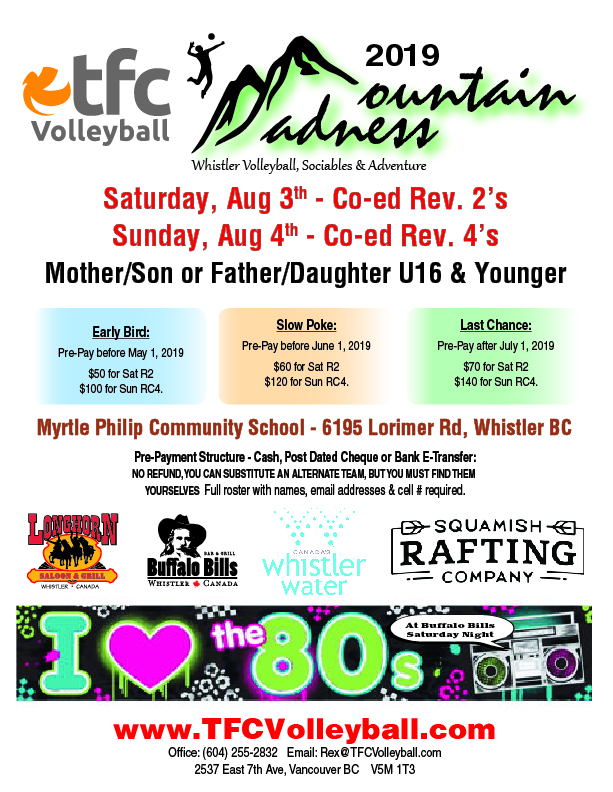 Tournament party / dance Sat, August 3th, 2019 in the Whistler Village starts at 9pm. Longhorn Pub for dinner (7:30pm) then Buffalo Bills for the 1980's dance party at 9pm. 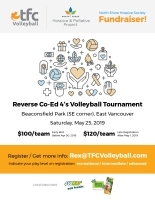 In 2018, TFC Volleyball partnered with Volleyball BC to deliver its first Reverse 2’s / Reverse Coed 4’s Grass Provincials at Beaconsfield Park in east Vancouver. 16th annual - 24 Hour R4 Fundraising Tournament starts 9am Sat, January 4th ending 9am Sun, January 5th, 2020. 'FULL' team check-in @ 8:30am on Sat, January 4th. Captain & one team Alternate 'must' attend the Captain's Meeting at 8:45am. ONLY one 'extra' male & female addition permitted per team. You 'must' play one full game in the round robin to qualify for the tiered double knockout play-offs. 3 tiers (Gold/Silver/Bronze) double knockout play-off divisions. Maximum 24 teams. Fundraiser 'generally' fills early November. $1000 from tourney proceeds being donated to the Burnaby South Secondary School boys/girls athletic program. 21st annual: 2-day tournament from 7:30am to 6pm. ** Indicated prize money based on a full 28 team tournament. If less than 28 teams participate in the tournament, the prize money will be reduced proportionally per division. The Tournament Director may combine divisions if there are not enough registrants to structure 2 complete tiers. The $100 Performance Bond will be returned on the last day of the tourney if your team has met all the tournament, uniform, reffing, Captain's meeting, etc. requirements. Download TOURNAMENT INFO & ROSTER FORM here. ** Co-Ed 6’s (CE6): 3 gals on the court, co-ed height net.